English painter. From c. 1756 to 1761 he was a pupil of Samuel Scott, the topographical and marine painter; he also studied at the St Martin s Lane Academy, London. Throughout his career Marlow made oils and watercolours of London views, for example Near Westminster Bridge, Evening (London, Guildhall Art Gallery), which shows his balanced, classical sense of composition, sensitivity to lighting effects and smooth handling of oil paint. Between 1765 and 1766 Marlow travelled in France and Italy, making numerous drawings of ruins, which provided the subjects for many paintings finished on his return to London. An Oxcart in the Grotto of Posillipo (c. 1770; New Haven, CT, Yale Center for British Art) exemplifies his bold, blue-toned watercolour style, with washes applied in loose blotches to emphasize the picturesque roughness of masonry and terrain. The handling has much in common with Canaletto, whom Marlow copied; a letter of 1771 from Horace Walpole to Sir Horace Mann records that two views of Verona by Marlow were mistakenly sold as Canalettos. Marlow specialized in souvenirs of the Grand Tour, portraits of country houses, seascapes and river scenes. He visited many parts of Britain and Ireland in search of subjects, such as Powys Castle, Montgomeryshire (University of Manchester, Whitworth Art Gallery). He exhibited at the Incorporated Society of Artists from 1767, was made a Fellow in 1771 and Vice-President in 1778. He exhibited at the Royal Academy, London, from 1788 to 1807 but never sought membership. 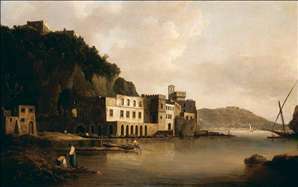 See more details about "View of the Bay of Naples from Posillipo"